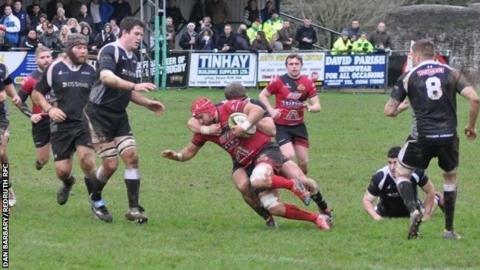 Launceston director of rugby Neil Bayliss says the club's defence is impressing him this season. Only National Two South leaders Henley and second-placed Dorking have conceded fewer than the 337 points the 10th-placed Cornish All Blacks have. "Our defence is fantastic and has been fantastic all season," said Bayliss. "I think the boys are realising they can trust one another in defence and that's a source of any good team if it's built around your defence." In attack Launceston have scored 372 points, the ninth-best record in the 16-team league, and that is the area Bayliss and his side are working on. "We need to look at attack and be scoring a few more tries, it's something we're trying to look at in training at the moment," he told BBC Radio Cornwall. "Everyone's working hard, everyone's working for their shirt and that's proving in the results that we're getting." Launceston host bottom-of-the-table Dings Crusaders on Saturday, with the visitors having not won away from home all season. "Dings are at the wrong end of the table at the moment and they're a team that are always fighting and somehow survives," said Bayliss. "We've got to be fully aware and fully on our game as they're going to try and come down and spoil our party. "We just need to focus, concentrate and put in a full 80-minute performance and I'm sure we'll be OK."